In Kids' Lunch, take a look into what people in the food world and the world at large pack their children (and occasionally their signifcant others and maybe even their pets) for lunch. Today: Prerna Singh of Indian Simmer has a daughter who demands simple, utensil-free food that is also "pretty," and this lunch meets all of the requirements. I grew up eating my mum’s steaming hot dal-chawal (steamed rice and lentil soup) with a dollop of ghee and crispy papadum on the side, which our housekeeper would bring to school every day during lunchtime. I guess life was just simpler and slower back then, and those simple luxuries felt like a norm. Things definitely are not the same anymore. But sending the kiddo with a home-cooked meal everyday is my way of giving her what I had as a child. It’s not always easy (who am I kidding! ), but not impossible either—just a little homework and preparation goes a long way. Aashvi, my daughter, is a 5-year-old who knows exactly what she wants and will only settle for that. She wants her food to be simple, preferably something that she can eat with her hands without getting them dirty (or she’ll wipe them clean after every bite), and she wants it to be colorful and “pretty." So, while sticking to her rules, I try to cover the basics like one protein, something green, something from the grain group, a fruit, and of course a treat (which, many times, is a fruit of her choice). On weekends, we sometimes like to make it fun and come up with creative ways to make her parathas (layered Indian flatbread) and idly (steamed lentil rice cakes). Asking her for ideas always helps because then I feel she is more open to trying new flavors. I would be lying if I say that she always comes home with an empty lunchbox, but mostly, we get thumbs up. 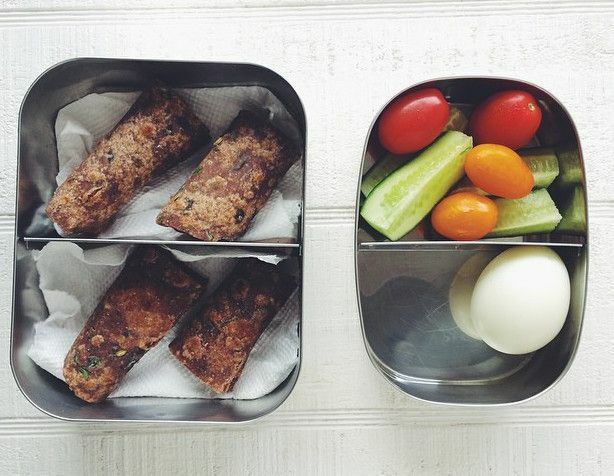 Typically, her lunchbox looks like what I made today: tofu paratha with whole wheat and ragi (finger millet) flour, turned into cream cheese rolls, along with sliced Persian cucumber, sweet baby tomatoes, and a boiled egg. To find what else I pack in her lunchbox you can follow #inherlunchbox @prernasingh on Instagram. Having a servant bring lunch to school seems ultra luxurious, hardly simple, in modern American society. Catering to kids' likes and dislikes is also luxurious. So many in the world have no choice. And it wasn't too long ago that we here in the US had no choice, either. Food was provided, we ate.